Speak to our friendly customer care operators to receive an estimate for exterior and interior window cleaning today. Call 020 3746 1366 or fill up the contact form - we will be quickly back to you. Proper gutter cleaning must be done at least once a year to avoid clogging of the downpipes and gutters. 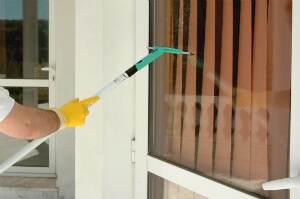 Ashlee House Cleaning can provide you with efficient and top-quality gutter cleaning. The gutter cleaners are ready to use the professional dry or wet vacuum cleaners and telescopic poles to get to any rubbish. Tiny cameras mounted on the end of the poles allow the cleaners to find and clean all leaves, twigs and other residues. You will be given before and after pictures of the condition of your gutter and downpipes. We give our customers a quality guarantee of 1 month for the service. We have highly seasoned roof cleaners who can bring your roof back to spotless condition in no time. They use powerful pressure washing equipment as well as telescopic poles which could eliminate algae, lichen, mildew, icky discolorations and moss from any roof. That will certainly help make your property look more appealing, and will keep it safe from destruction from all the potentially harmful growths on it. You may save lot of money for repairs, by choosing our service. We guarantee that your rooftop is nice and thoroughly clean and we will do it at a very reasonable price. If you need assistance with the cleaning of your gutters, your roof or your outdoors windows, do not think twice to request our top quality cleaning services right now! When there is certainly no one, who is able to care of your commercial building windows, possibly, the enthusiastic experienced window cleaners in Hoxton N1 are right here to help you. We are at the same time available for industrial window cleaning services in Hoxton N1. All kind of business properties are accepted: hotels, offices, restaurants, IT buildings, stores. Note that our special safe system for window and gutter cleaning can reach up to fourth floor. Conservatory window cleaning requests are also accepted! We have a highly effective system for service reservations. Our customer support staff is available 24-7 to process your requests. Simply just call 020 3746 1366 or complete our booking form. Within the following two hours you will be sent an e mail verification for your reservation. Our professional window cleaners will clean without any ladders and without stalking into your home windows if you are up to the Fourth floor. Our services come at good rates, with no hidden fees. Book more than A single service and you will certainly save both time and funds. There are advantageous offers for those who book earlier, for our regular clients, as well as for regional property agencies and landlords. Therefore, if you really want your windows meticulously cleaned - get our window cleaning Hoxton N1 service now!